I switched from Chrome to Firefox a few months ago. For the most part…it feels roughly the same but there was one subtle difference that finally irked me to the point of googling: having to right click on a tab to close it. In Chrome, when you hover over the active tab the close button pops up. This means you can pretty easily close multiple tabs by clicking the last tab on the right, clicking close, and then repeatedly clicking as the close tab appears in each successive tab. Of course, you could also right click a tab and click “Close tabs to the right” but meh. My day job involves a lot of .NET Core development and a whole lot of logging. As a result, I’ve become accustomed to having logs when I need them. When working on pet projects I usually don’t spend as much time on the “niceties” of life. Lately I’ve started doing it a little more and wanted to detail some findings. There’s a lot of resources out there on using Microsoft’s new CommandLineApplication. You could read through those if you want, they mostly say the same things. I’ve recently started going through this brilliant article on creating your own text editor (read: nano/pico clone). If you’ve never built one this article breaks it down into easy to follow chunks. If you do go through it, you might notice the same thing I did. 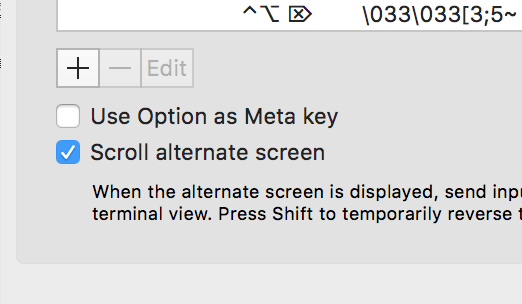 Page Up and Page Down doesn’t seem to work right (in Mac OS’ Terminal.app). Wait, what? How does it work in vim? Is it actually Terminal.app or is kilo not actually entering the elusive “raw mode”? I’ve been spending some time going through Philipp Oppermann’s amazing blog series, Writing an OS in Rust. Digging into operating systems has been on my todo list for years now and I couldn’t pass up the opportunity when I ran across this series on Hacker News. Phillip has done a wonderful job in his posts and they’re extremely easy to follow. Unfortunately for me, though, he’s doing his development via Linux so some of the instructions aren’t one-to-one. For instance, cross-compiling libcore for x86-64 on Darwin doesn’t really work and likely won’t for some time. That’s ok though, Vagrant to the rescue. After you have vagrant up and running, you can drop into ssh (vagrant ssh) and follow along with all of the posts. A database is an organized collection of data 1. Data is stored on disk and in memory in a manner that maximizes reading data in complex ways. Databases are extremely good at complex queries. They also excel at managing concurrency, data integrity and redundancy. Storing data on a file (referred to as a flat file) is fine. In fact in some situations, storing data in a flat file is better that using a database. In others it’s worse. Flat files shouldn’t be considered verboten but rather just another tool in your tool chest. You wouldn’t use a hammer to tighten a bolt, would you? Volker is writing a program that interacts with hardware via a serial port. He wants to be able to configure the port and communication settings without having to change his program. Consistency is important. Make sure that what you think you’re building is actually what you’re building. If you’re developing and testing in a Window’s environment but are intending to deploy to a Linux environment you’re going to get unexpected results. If you’re using Python 2.7 on your development machine and Python 3 on your production environment you’re not going to have a good day. If you’re using different package and library versions on your development and production environments you’re likely in for trouble. Your development platform is the environment you’re writing and debugging your code in. This might be a Windows machine or it might be a Raspberry Pi that you SSH into. I’ve recently been proof of concepting a new idea for work. It involves local and external access to MySQL servers. While transitioning from local development to a Vagrant VM I discovered the VM couldn’t access my host local MySQL server. Googling turned up some obvious answers, find my.cnf and remove bind_address = 127.0.0.1. I had installed MySQL using HomeBrew which installed MySQL to /usr/local/Cellar/mysql/5.7.10. My my.cnf configuration file was located in support_files within this directory. Much to my dismay there was no bind_address = 127.0.0.1. I participated in MUDJAM on Itch.io last year around this time, putting together a very simple, low feature deliverable, BerkMud. If the title doesn’t tell you, it was How to Train Your Dragon themed. It wasn’t my first foray into building a mud but I wanted to do something new so I did it in golang which was completely new to me. A year later, I got to thinking that there was a lot I had still wanted to do with it. One of those things was figuring out how some muds I used to play (DarkCastle) were able to reboot/upgrade the server without killing people’s connections. Carsforsale.com released our first incarnation of a consumer facing (for all you car buyers out there) Android application. Check it out!